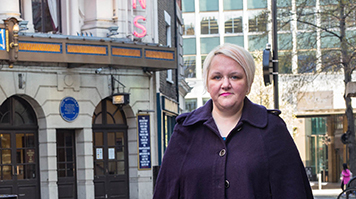 Claire Hood studied a Law Conversion course at LSBU, where she gained valuable work experience that helped her determine her next career move. Since completing the course part-time, Claire is now training to be a barrister. “As a teenager the one thing I really wanted was to live in London, so I did a degree in media studies because all the TV jobs were in London. It worked, and I had a succession of great jobs in the industry, working first for the BBC. When I had children I found my hours were too erratic so I moved into a compliance role, still in TV. When I was working in the legal team at Comedy Central my boss suggested I do a law conversion course so I could take on a more senior role. “I chose LSBU because at the time the fees were the lowest of all universities offering law conversion courses. I got a lot out of my time at LSBU but I also put a lot into it. I worked hard and always tried to go the extra mile. Because I was older, I was in a different position to many of the students – I was very clear about why I was there and what I needed to get out of it. “The work experience I did at Lambeth County Court during my course made me realise that corporate law was not for me. The court environment is exciting and what happens there can change people’s lives. Corporate law is very well paid but I would have been working on contracts and litigation about broadcast fees. In the end there was no contest – I knew I wouldn’t go back to the corporate world. “I did my law conversion course over two years part-time while holding down a job and looking after my children. It wasn’t easy and as a part-timer you often miss out on the extra activities that can enrich your time at university. The one thing I was determined not to miss was the University’s Mooting Competition which is where you work in teams to argue for and against a case in court. I had to take annual leave from work to do it, but it was worth it. "The Mooting Competition was one of the things that made me think seriously about becoming a barrister. It turns out that despite my nerves I was good at mooting and I began to realise I’d been wrong to assume that someone with a working-class background couldn’t become a barrister. My skills and my life experience had equipped me well, and I graduated from my conversion course in 2016 with a commendation. I’m currently working for Equity (the actors’ union) in a role that combines my entertainment background and legal training. I start training to become a barrister later this year. "I’m driven by the knowledge that I can use my education and skills to give a voice to people who otherwise might not be heard. Ordinary people can feel bewildered and powerless in court. I’d like to be known for giving a voice to these people, whether it’s the family facing eviction who don’t fully understand the law or an outsider group for whom guilt is often assumed. One of my legal heroes, Gareth Peirce defended the Guildford Four (Irishmen wrongly convicted of terrorist offences in the 1970s); that’s why I put her forward for the Inspired by Law gallery. In today’s climate the equivalent could be defending young Muslim men and women against similar charges. "The legal profession is open to people from a variety of backgrounds but you need to be determined and tactical in your approach. I’d advise, for example, that you really research the various chambers/solicitors firms before you apply for work experience or pupillage. Check what they specialise in and look at the backgrounds of the people who work there. If their intake is all Oxbridge graduates then maybe you wouldn’t feel comfortable, but if they recruit from a range of backgrounds and do work that interests you, don’t hold back. It takes focus to get on and I’d urge anyone who wants a career in law to do your research and get all the work experience you can."